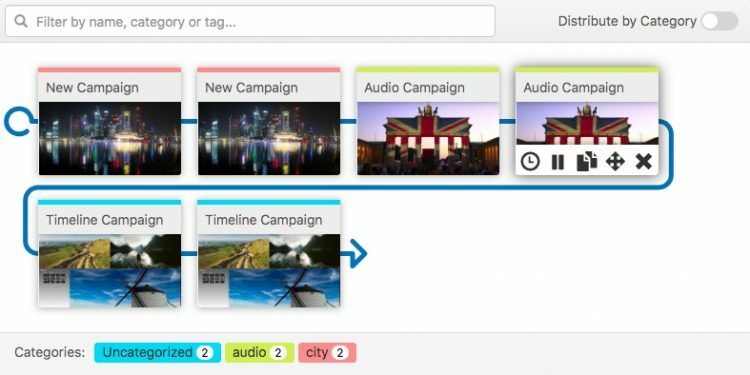 Use Playlists to organize and distribute your Campaigns by Category. Add as many Campaigns as you want to the Playlist loop. At this point the order does not matter. Note that the amount of campaigns and how many times each Category was used is shown at the bottom of the page. Note: You can use the “Duplicate” button on the thumbnail in order to create Campaign copies, instead of dragging the same Campaign to the loop repeatedly. Once you have inserted all Campaigns you want in the Playlist, enable “Distribute by Category”. Another dialog window will prompt requesting confirmation. Now all Campaigns are neatly ordered without Categories repeating in the loop. From now on, each time you drag a new item to the loop, it will be arranged evenly in order to keep distribution. In case you modify the Campaign order, the "Distribute by Category" option will be disabled, but the current Campaign playback order will be kept. In case you want the next items added to be distributed evenly according to their category, enable the option on the top of the page again. Highlight Campaigns by typing cat: followed immediately without space by the specific Category in the search box on top. You can also search for a Campaign's name. Publish the Playlist to Players. Important: After publishing the Playlist, the Campaign loop order won’t be modified if you change a Campaign’s category. 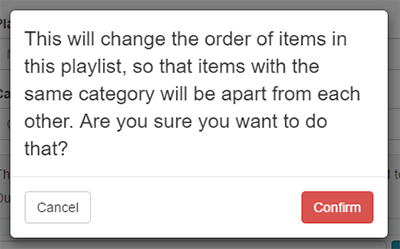 The previous order will be maintained until you re-edit the Playlist after the Category modification.